Business Demography Statistics are new statistics and were designed to provide a detailed analysis of business population and to provide an image of quantitative and qualitative aspects for various NACE divisions/groups and their development over a longer period of time. Business Demography Statistics keep track of data on the number of active enterprises, births and deaths of enterprises and enterprises that survive through the first, third and fifth operational years after their birth, as well as data on turnover and persons employed. The statistics cover the period 2008-2017 and are broken down by industry according to ÍSAT2008. Business Demography Statistics are based on Eurostat and OECD harmonized methodologies. Therefore, they are comparable to statistics in other European countries. The statistics are based on tax returns of enterprises and individuals. It covers the private sector except agriculture, financial and insurance services. Public administration, health and social services, educational activities, cultural, sporting and recreational activities, as well as NGO activities are excluded. Out of 3,080 enterprises that were born in 2012, 1,271 enterprises were still active in 2017 and 2,700 persons were employed in these enterprises. There were over 30,000 active enterprises with 134,000 persons employed in that year. The majority of enterprises born in 2012 were in professional, scientific and technical activities, approximately 600 enterprises. However, in 2017 only 225 were still active. 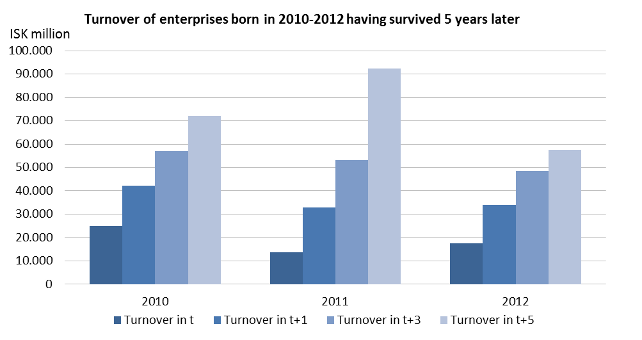 Turnover of enterprises, born in 2012, increased by 228% during the 2012-2017 period. It resulted in 27% annual compound growth. Turnover of these companies amounted to over 18 billion ISK in 2012, which increased by 40 billion ISK and amounted to 58 billion ISK in 2017. The number of persons employed in these enterprises increased by 69%, from 1,600 persons employed in 2012 to 2,700 persons employed in 2017. In the wholesale and retail trade, turnover of five-year old enterprises increased by 10 billion ISK between 2012 and 2017 (at 24% CAGR), from 6 billion ISK to 16 billion ISK. There was a 12% annual compound growth in the number of persons employed, from 307 persons employed in 2012 to 544 persons employed in 2017. In tourism industries, turnover in enterprises, which were born in 2012 and had survived to 2017, increased by 9 billion ISK (at 34% CAGR) from 3 billion ISK to 12 billion ISK. There was a 15% annual compound growth in the number of persons employed, from 349 persons employed in 2012 to 697 persons employed in 2017. More data on Business Demography Statistics will be published on the 23rd and 25th of January. Enterprises considered being active when they have operating income or personnel costs. When operation of enterprise moves between identification numbers, it is not considered to be an enterprise birth unless two of the following three conditions are met; operation is in another economic sector according to ÍSAT2008, operation is carried out at another location or the majority of staff has been changed. Adjustments are also made in connection with mergers and split-offs. All amounts are at current prices. Notes: 1Transport (total); Accommodation, food and beverages; Leiga á vélknúnum ökutækjum; Renting and leasing of motor vehicles, recreational and sports goods; Travel agency, tour operator and other reservation service and related activities. 2Transport (total); Accommodation, food and beverages; Renting and leasing of motor vehicles, recreational and sports goods; Travel agency, tour operator and other reservation service and related activities. Manufacture of chemicals and chemical products; Manufacture of weapons and ammunition; Manufacture of computer, electronic and optical products; Manufacture of electrical equipment; Manufacture of machinery and equipment n.e.c. ; Manufacture of motor vehicles, trailers and semi-trailers; Manufacture of other transport equipment; Manufacture of medical and dental instruments and supplies; Postal and courier activities; Publishing activities; Programming and broadcasting activities; Telecommunications; Computer programming, consultancy and related activities; Information service activities; Scientific research and development.